We found out about the performance benefits of keto-adaptation by accident. I was the co-administrator of a trail running group, the Tucson Trail Runners (TTR) from 1990 until the summer of 2018, and am still very much involved with the group. We put on a series of multi-hour runs in the mountain ranges surrounding Tucson. Many of the participants on the runs use them to train for ultramarathons, runs longer than the marathon. I’ve completed 100 miles on foot a couple of times, and numerous shorter ultras. Many of the group members are more experienced with long runs, especially in the past decade or so as I’ve shifted to bicycles. In the summer of 2012, when I first came across Gary Taubes’ “Why We Get Fat,” I shared it with my friends Steve and Donna, who are members of the running group. They read the book, thought it made sense, and decided to try the low carb, high fat diet that Gary advocated to lose a few pounds. Donna created an amazing number of lists of the grams of carbohydrates in everything they ate. Then they dropped their daily carb count to under 100 grams, sufficient to go ketogenic if one isn’t terribly carbohydrate sensitive. In the current high carb environment, Gary says endurance athletes are a self-selected group from that quarter of the population that is relatively carb tolerant. Steve told me there was about a 10 day adjustment period during which he felt weak and worthless. I’ve since learned that as your body shifts from glucose metabolism to fat-derived ketone bodies, it stops storing glycogen, which is bound up with several pounds of water. Your body excretes the excess water along with some electrolytes and minerals. Volek and Phinney encourage people to take supplements during this period to minimize any discomfort. Once past the adjustment period, there was a period of real weight loss. 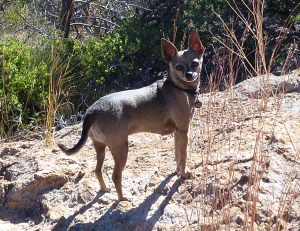 In the end, Steve dropped about 10 pounds, Donna dropped 4-5 pounds, and their Trail Chihuahua Hombre lost 0.5 pounds. That doesn’t sound like much, but remember, they were already endurance athletes who trained regularly and ate supposedly OK diets before. But the weight loss wasn’t the most interesting part. Steve started telling me that he wasn’t finding himself taking naps. He was noticing more energy during his morning runs. He wasn’t getting as hungry, either exercising or otherwise. During long exercise bouts, he didn’t need to eat the sugar-based food and drink typically used by conventional carb-adapted athletes. This culminated in a 700 mile bike ride he and Donna did with several friends on the Pacific Coast Highway. They had ridden this route before (further, actually) with the friends. This time the friends couldn’t keep up with Steve and Donna on the hills. Afterwards, two of the three friends decided to try a low carb, high fat diet themselves. I’m told their results have been similar to Steve and Donna’s. This result surprised me. On and off, I’ve read about exercise physiology since the mid 1970s when I started running. I thought I knew how our muscles worked, and that some glucose was always required. The proponents of ketone-adaptation claim otherwise. I realized I needed to see if I could replicate this result. I was also in the process of becoming ketone-adapted, although I wasn’t as aggressive about it as Steve and Donna. That’s partly because I can’t run well enough anymore to measure my own performance accurately, although I could tell some differences on my bikes. I needed guinea pigs. I sent a note to the members of TTR. I described Steve and Donna’s results and suggested the possibility of improved performance. That immediately caught several runners’ attention. I had included Gary Taubes in some of my notes to the group. Gary told me I should look at Jeff Volek and Steve Phinney’s “The Art and Science of Low Carbohydrate Performance.” I got the book and referred the keto-TTR experimenters to it. Since then I’ve read their larger volume, “The Art and Science of Low Carbohydrate Living,” which helped me understand the underlying biology much better. More information, including where to buy the books, can be found on their website. Every runner who has become ketone-adapted and stayed with it has had results similar to Steve and Donna’s. They usually lost some weight. They found they had more energy, better endurance, and improved recovery after an endurance bouts. A couple of the experimenters had had some problems with stomach upset in long runs or rides. Once they stopped having to consume food or drinks containing sugars, those problems went away. No one got any faster, but they could perform well longer. This is consistent with what Volek and Phinney said would happen. This is an experiment anyone can try who wants to attempt to improve athletic performance. TTR’s orientation is endurance performance, but Volek and Phinney claim similar results for athletes doing resistance activities, such as CrossFit or power-lifting. Steve and Donna have since started CrossFit and agree. At a low carb conference I attended in the summer of 2016, several presenters were resistance trainers.